As most of you may know, Maison Mercer is closing its doors due to the Nobu development in the near future. 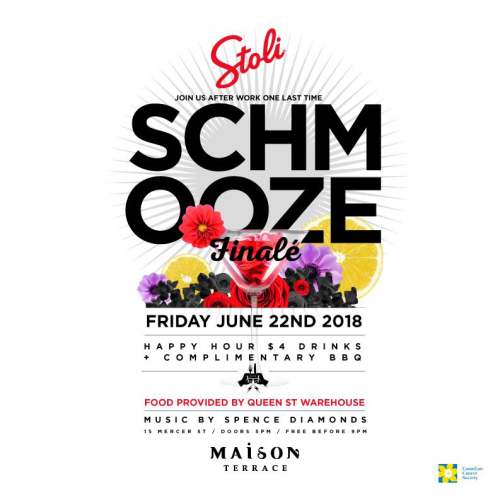 Due to popular demand and people asking when the next Schmooze is, Maison Mercer is hosting this popular patio event ONE LAST TIME! After a hard day’s work, spending a summer evening with friends and colleagues is the best way to relax. SCHMOOZE offers a spectacular view of the horizon, offering refreshing beverages on the terrace, relax after work while enjoying free barbecue. Cover is free, however, there will be an optional donation at the door with all proceeds going to The Canadian Cancer Society. Music by Spence Diamonds .